8 - 10 Nov 2016 ZUJI: All Flights on 4 Airlines on Sale from $255 (Return)! If you missed the last ZUJI Flash Sale on Singapore Airlines flights, dun miss it this time! 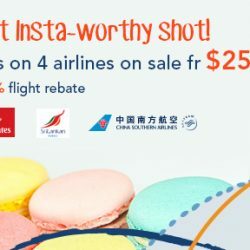 Besides Singapore Airlines, 3 other airlines will also be on sale - Emirates, Sri Lankan Airlines and China Southern Airlines starting from $255 (return). No matter where you want to go, surely your destination will be covered by one of these airlines! If you haven't decide, how about London, Paris, Maldives or Hong Kong? These are just a few of the destinations you can choose from! Save on the air tickets at ZUJI and book your hotel as a package together so that you can spend more during your holiday. In addition, you get to enjoy 5% flight rebate or 6% package rebate when you pay with MasterCard and an additional $50 rebate with payment via a Stored MasterCard. You can also redeem a free luggage with a minimum spend of $2,500! Terms and conditions apply. Get that Instagram-worthy shot now! Book by 10 November, 2359hrs!